Who Loves Me? : A love story. Sometimes we forget how much our family means to us. This is a perfect picturebook to remind of who loves us just before bed. A beautiful story of comfort and assurance. Of course there is also a very wise cat. PreSchool-Grade 3–In this simple, soothing bedtime story, a little girl asks the title question, and her striped orange cat offers a litany of those who love her until the child drifts off to sleep. Their quiet conversation covers everyone from her parents and brother to the family dog, who would love her even if she didn’t give him treats. Shepherd’s stylized illustrations are bathed in rich, warm shades of goldenrod and ochre, through which MacLachlan’s cozy, comforting dialogue meanders like a song. A warm and lyrical selection. Book Loons When a little girl wonders who loves her, a wise cat supplies detailed and reassuring answers, written by Patricia MacLachlan. 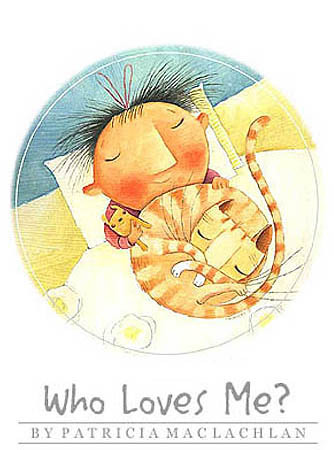 The child asks first at nighttime as ‘Moonlight falls across her bed.’ Amanda Shepherd’s illustrations pick up the warm orange and yellow tones of the cat’s striped fur, painting emotions across the page.